After a 2,600 year old shipwreck was found back in 1988 off the coast of Gela in Sicily, a team of marine archaeologists now discovered 39 ingots, (metal cast into rectangular blocks), scattered across the sandy sea floor close to the site. Sebastiano Tusa, Sicily’s superintendent of the Sea Office, stated in an interview that the precious ingots were probably being brought to Sicily from Greece or Asia Minor and that the discovery is significant since “nothing similar has ever been found,” and “we knew orichalcum from ancient texts and a few ornamental objects.” Orichalcum has variously been held to be a gold-copper alloy, a copper-tin, or copper-zinc brass, or a metal no longer known. Where does this mysterious metal come from? The name orichalucum derives from the Greek word oreikhalkos, literally translated as “mountain copper”. 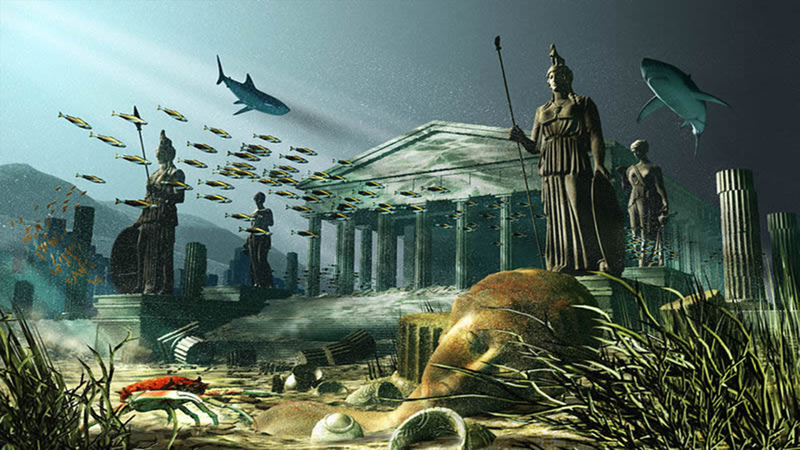 According to Plato’s 5th century BC Critias dialogue, (which contains the story of the mighty island kingdom Atlantis and its attempt to conquer Athens), orichalucum was considered next to gold in value, and was found and mined in many parts of the legendary Atlantis in ancient times. Plato discussed that the three outer walls of the Temple to Poseidon on Atlantis were clad with brass, tin, and the third, which encompassed the whole citadel, flashed with the red light of orichalcum. The ancient Greeks say that orichalcum was invented by Cadmus, who was a Greek-Phoenician mythological character. Cadmus was the founder and first king of Thebes, the acropolis of which was originally named Cadmeia in his honor. And it’s not only the Ancient Greeks. Orichalcum is also mentioned in the Antiquities of the Jews, by the Jewish historian Flavius Josephus who wrote the twenty-volume historiographical work in the thirteenth year of the reign of Roman emperor Flavius Domitian around AD 93 or 94. In book VIII, section 88, he stated that the vessels in the Temple of Solomon were made of orichalcum (or a bronze that was like gold in beauty). Today, some experts suggest that orichalcum is a brass-like alloy, which was made in antiquity the process of cementation, achieved through the reaction of zinc ore, charcoal and copper metal in a crucible. All in all, the latest discovery of these orichalcum ingots that have been on the sea floor for nearly three millennia may unravel not only the mystery of their origin, but also the quest for Atlantis.